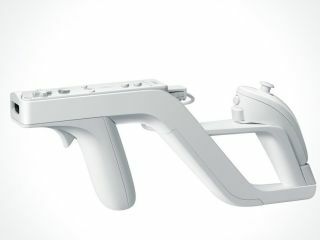 Nintendo has announced that the much hyped Zapper peripheral for its Wii console will go on sale in the US on 19 November. The Wii Zapper combines both your Wii Remote and the Nunchuk into one rifle-style shooting controller. "The Wii Zapper combines our remarkable controllers into one housing with a classic style reminiscent of arcade-style games," says George Harrison, Nintendo of America's senior vice president of marketing and corporate communications. "Both veteran and first-time players will find it brings a whole new dimension to games where targeting is key and provides even more exciting game-play experiences." Until now, players of shooter games on the Wii like Medal of Honor: Vanguard have had to handle the Wiimote and Nunchuk separately. It's certainly playable, if a little fiddly. Nintendo also said that the Wii Zapper will come packed with Link's Crossbow Training. The software is based on the hugely popular Legend of Zelda series and demonstrates the way the Wii Zapper could be used in other games. The Wii Zapper will cost $19.99 (around £10) in the US. It hasn't been officially announced in the UK yet, but chances are Nintendo will opt for a straight dollars-to-sterling cost conversion. Lots of third-party games developers have already confirmed that they'll be supporting the new Wii Zapper. EA's Medal of Honor Heroes 2, Capcom's Resident Evil: The Umbrella Chronicles and Sega's Ghost Squad will all let you replicate the arcade light-gun experience at home with the Wii Zapper.